Jeans have hit the fall runways. And not the jeans that you're thinking of, patterned beauties that set the bar of jean potential that much higher. So what jeans will be guaranteed to make a statement? Just look at the Fall runways for your answer. 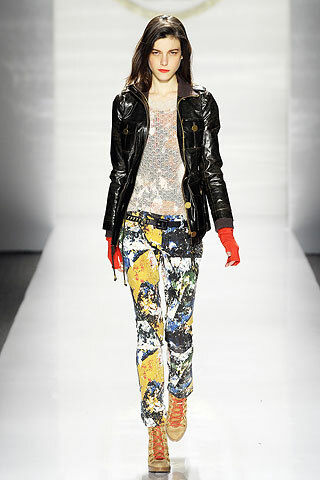 The collaboration of J.BRAND jeans and Proenza Schouler for the Fall 2010 season is a beautiful and intricate result: patterned jeans worn at the Fall 2010 RTW show. The pants were worn with a variety of tops including sweaters and jackets; and come in both royal blue and white. The jeans can be purchased from Neiman Marcus's website for $550.00 in white and in sizes 26-29. The jeans are perfect for wanting to make a style statement and can add some color without over powering your top. At Tory Burch, statement jeans are having their chance to shine as well. With a colorful pattern that is sure to catch anyone's eye; these jeans are not for those who want to blend in, rather, those who are having a hard time standing out. Take your pick: a matching top or a hard-core leather jacket. The jeans can be purchased online at the Tory Burch website for $225.00 and can be bought in sizes 24-32. There are other patterns on the website as well including a tie-dye pair and a zebra look-alike pattern. Each of these can be purchased for $225.00 (zebra-like) or $195.00 (tie-dye). Which ever jeans you choose to make a statement in for the Fall 2010 season, make sure that the jeans fit perfectly. Even if you are wearing the $550.00 Proenza Schouler jeans, if they don't fit right, you won't be getting jealous looks; you'll be getting "What is she wearing!?" stares. What do you like to pair your jeans with? Email me and give your opinion; it might even end up on my blog! Trade in your boring jean-and-tee-shirt combo for something a little more interesting: a printed top AND bottom. Though fashion rookies may be calling me crazy right now, by mixing prints, you can draw attention to yourself in a good way. So the key to mixing prints? Stick to the same color palette and keep with the concept of simple and complex. Sticking to the same color palette simply means that the top and bottom of your outfit share the same shades of color. For example, if your bottom piece has blue, red, orange, white, and black; a top that would look best would be one with the same shades of blue and white, black and orange, red and white, black and blue, etc. Second, when you are mixing patterns, either choose a simple-simple combination or simple-complex combination. Just choose if your print is either simple or complex before pairing it up with another piece. Simple patterns include plaid, argyle, and dots; while complex includes prints with 3 or more colors. Finally, mix either 2 simple pieces or a simple and complex piece WITH THE SAME COLOR PALETTE to create an outcome of a flawlessly paired printed outfit. With designers showing off their new fall lines and September issues bursting with images and articles of the new season, everyone is swapping their summer wardrobe and warming up with something a little less revealing. So how can you stay on top of your fashion game? Try one of (or all of!) Fall's Top 4 (yes, 4) trends. First, polish off a look with a newly popular accesory: geek glasses (picture clear, classic Ray-Bans). These glasses have been seen at shows that include Jason Wu and Prada. I recently paired them with dark wash jean shorts, an oversized "The Smiths" tee to look like a tank top, a straw and plaid fedora, gladiators, teal bangles, a teal geode slice necklace, and a borrowed-from-the-boys brown woven leather belt. Second, trade in your skinnies (so last season) for a pair of leg-lengthening, high-waisted flare jeans. These pants do wonders in terms of "growing" you longer legs and pair perfectly with just a simple graphic tank. Third, toss out your neons and trade them in for a calmer approach: neutrals. Tan (Burberry trench tan that is), brown, and black are all big on the runways. At Michael Kors, they were both mixed all together, as well as shown seperatley in an all-tan or all-black ensemble. If you don't want to go all out in neutral, try a hued top with jeans for bottoms, embracing the trend and putting a personal spin to it. Fourth and finally, keep it simple this season by going with a few pieces with clean lines such as a fitted blazer or pencil skirt. Avoid piling on a ton of necklaces and go for a small one or none at all instead. Loves to dance and be crazy with friends. Enjoys all the inspiration and feeling behind the music of Morrissey & the Smiths. 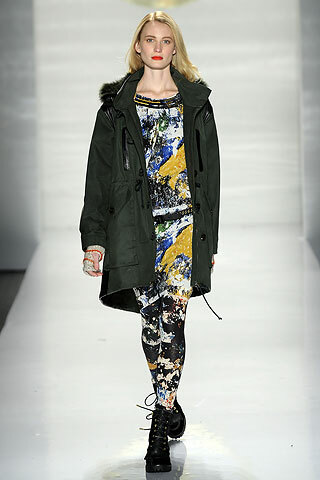 Loves Marc Jacob's Marc by Marc Jacobs line & the elaborate Chanel runways. Thinks style should be spontaneous. Follow me or comment if you like my blog! How Many Times Have You Visited eat-sleep-style? "Fashion fades, style is eternal"